The ANS Synthesiser at the Glinka Museum Miscow. The ANS Synthesiser takes it’s name and inspiration from the Russian composer Alexander Nikolayevich Scriabin (A.N.S. ), whose mystical theories of a unified art of sound and light had a huge effect on avant-garde composers and theoreticians in Russia during the early Soviet period. Murzin’s objective was to build an instrument that combined graphics, light and music that gave the composer an unlimited palette of sound and freed them from the restrictions of instrumentation and musicians; a direct composition-to-music tool. The ANS was a product of a culmination of several decades of exploration in sound and light by composers and artists such as Andrei Aramaazov, Boris Yankovsky, Evgeney Sholpo and others. To generate sound it uses the established photo-optic sound recording technique used in cinematography; this technique makes it possible to obtain a visible image of a sound wave, as well as to realise the opposite goal – synthesizing a sound from an artificially drawn sound wave. One of the main features of the ANS that Murzin designed is its photo-optic generator, consisting of rotating glass disks each containing 144 optic phonograms (tiny graphic representations of sound waves which, astonishingly, were hand drawn on each disk) of pure tones, or sound tracks. 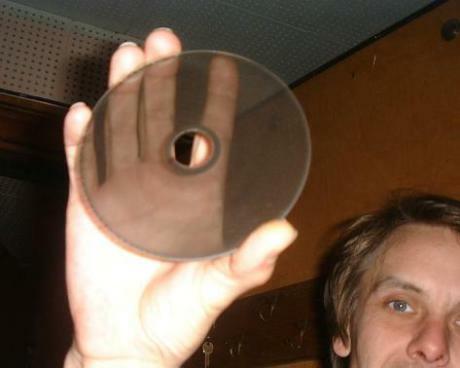 A bright light beam is projected through the spinning disks onto a photovoltaic resulting in a voltage tone equivalent to the frequency drawn on the disk; therefore the track nearest to the centre of the disc has the lowest frequency; the track nearest to the edge has the highest. Given a unit of five similar disks with different rotating speeds the ANS is able to produce 720 pure tones, covering the whole range of audible tones. The composer selects the tones by using a coding field (the “score”) which is essentially a glass plate covered with an opaque, non-drying black mastic. The vertical axis of the coding field represents pitch and the horizontal, time in a way that is very similar to standard music notation. The score moves past a reading device which allows a narrow aperture of light to pass through the scraped off part of the plate onto a bank of twenty photocells that send a signal to twenty amplifiers and bandpass filters. The narrow aperture reads the length of the scraped-off part of the mastic during its run and transforms it into a sound duration. The minimum interval between each of the tones is 1/72 of an octave, or 1/6 of a semitone, which is only just perceptible to the ear. This allows for natural glissando effects and micro tonal and non-western scale compositions to be scored. The ANS is fully polyphonic and will generate all 720 pitches simultaneously if required – a vertical scratch would accomplish this, generating white noise. The non-drying mastic allows for immediate correction of the resulting sounds: portions of the plate that generate superfluous sounds can be smeared over, and missing sounds can be added. The speed of the score – the tempo of the piece – can also be smoothly regulated, all the way to a full stop via a handle at the front of the machine. 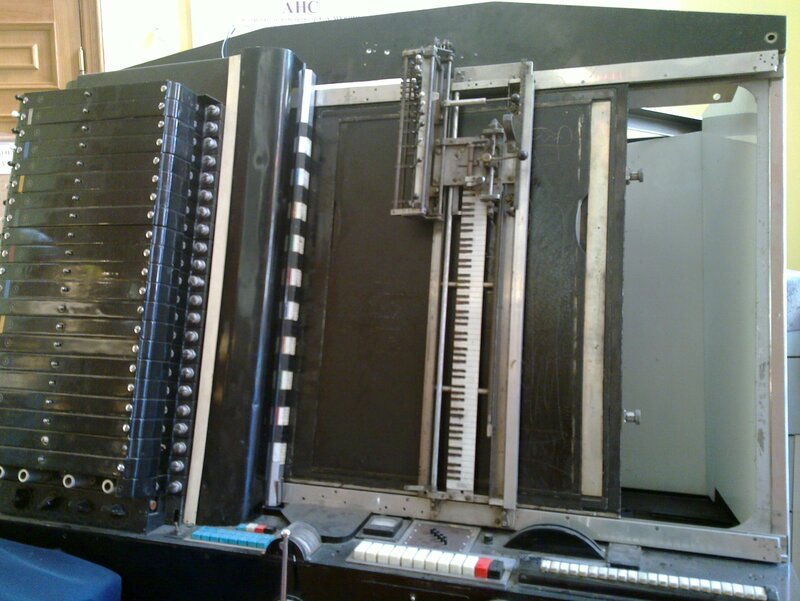 Murzin built only one version of the ANS, a working version currently resides at the Glinka State Central Museum of Musical Culture in Moscow. Martinov, Edison Denisov, Sofia Gubaidulina, Alfred Schnittke, Alexander Nemtin. An example of an ANS score, picturing graphic structures that were drawn freehand on the mastic-covered plate. In 1961 I composed the music for the film Into Space. Artist Andrew Sokolov’s cosmic paintings appeared as moving images in the film, smoothly changing into each other and dissolving into fragments by means of cinematic devices. The light and color of Sokolov’s cosmic landscapes generated complex phonations and sound transitions in All this makes it possible for the composer to work directly and materially with the production of sound.my mind. The movement of the cosmic objects on the screen initiated the rhythms of my music. I tried to express all this by tracing it on the ANS’s score, making corrections after listening to the resultant sounds in order to gradually obtain the suitable phonation. I finally felt that the sounds produced by the ANS synthesizer on the basis of my freehand graphic structures correlated perfectly with the pictures on the screen. From 1967 to 1968 I experimented with moving timbres on the ANS and studied different modes of animating electronic sounds. During this period, I composed the following pieces for performance on the ANS: “Echo of the Orient”, “Intermezzo”, “North Song” “Voices and Movement” and “Scherzo”. All of these were composed traditionally for orchestra previous to my work with the ANS. When I coded these orchestra scores on the ANS, I wanted to solve the problem of animating electronic sounds, so that the phonation of the ANS could approach that of the orchestra. These pieces appeared on a recording entitled ANS, which was produced in 1970 by MELODIA record label. Later I used the ANS to help me compose the music for a puppet show that incorporated the use of light called ‘Fire of Hope’, which was based on Pablo Picasso’s works. The play was performed in 1985 at a festival in Moscow and in 1987 at a festival in Kazan by the Moscow group Puppet Pantomime, under the artistic direction of Marta Tsifrinovich. My composition Variations, written for the ANS, was also performed during the 1987 Kazan festival. Murzin began his academic life studying municipal building at the Moscow Institute of Engineers. When Nazi Germany invaded the USSR in 1941 he joined the soviet Artillery Academy as a senior technical lieutenant. 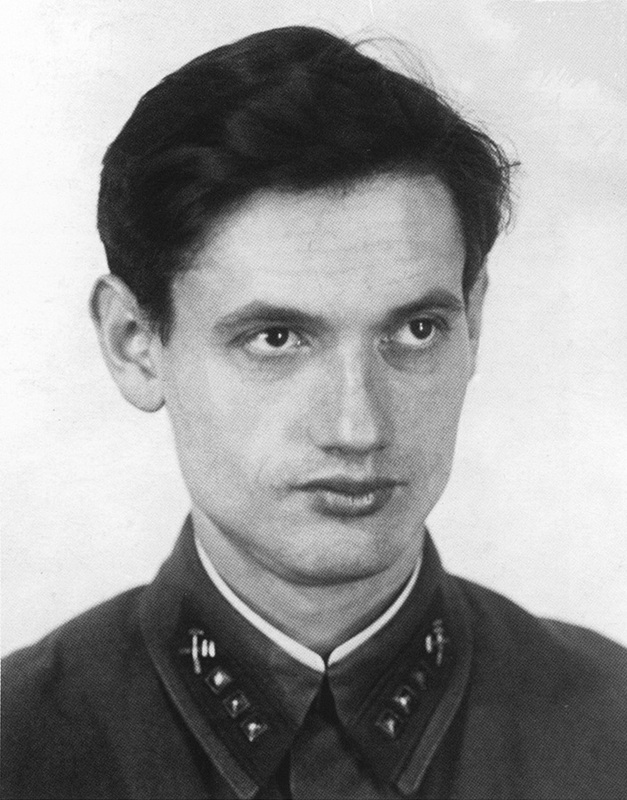 During his time in military service Murzin was responsible for developing an electro-mechanical anti aircraft detector which was later adopted by the soviet army. After the war Murzin joined the Moscow Higher Technical School where he completed a thesis on Thematics and was involved in the development of military equipment including an artillery sound ranging device, instruments for the guidance of fighters to enemy bombers and air-raid defence systems. Murzin had a reputation as an admirer of jazz but when a colleague introduced him to the works of Scriabin, Murzin became obsessed with the composers work and synaesthetic concepts. It was these ideas that inspired Murzin to begin his ‘Universal Synthesiser’ project around 1948 which was to lead to the ANS synthesiser some decades later. Murzin presented his proposal to Boris Yankovsky and N.A.Garbuzov at the Moscow Conservatory where, despite initial reluctance, he was given space to develop the instrument. Despite almost universal disinterest in his project Murzin continued over the next decade to develop the ANS prototype with funds from his own finances and working in his spare time with the help of several friends (including composers E.N Artem’eva, Stanislav Kreychi, Nikolai Nikolskiy and Peter Meshchaninov). The first compositions using the ANS were completed in 1958 and exhibited in London and Paris. The ANS was moved to the Scriabin Museum in 1960 (ul. 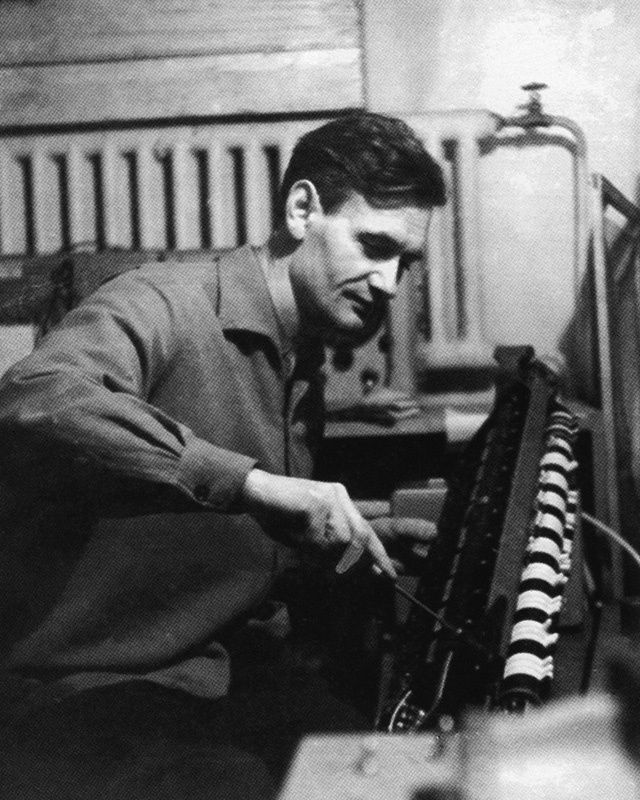 Vakhtangov 11, Moscow) and formed the basis of the USSR’s first electronic music studio which was used throughout the sixties’ by many world famous composers including Schnitke, Gubaydulina, Artem’ev, Kreychi, Nemtin and Meshchaninov.